» A 1001 MIDNIGHTS review: RUFUS KING – Malice in Wonderland. A 1001 MIDNIGHTS review: RUFUS KING – Malice in Wonderland. RUFUS KING – Malice in Wonderland. Doubleday Crime Club, 1958. Queen’s Quorum 117. Rufus King had two distinct “careers” in crime fiction. The first was as a writer of traditional Golden Age whodunits, beginning in 1927 and continuing until 1951. He produced twenty-two novels during this period, most of which are entertaining despite some stilted prose; they are marked by clever plotting, interesting backgrounds, and touches of gentle humor. King’s best work, however, is his short fiction, particularly that written during his second “career” in the 1950s and 1960s when he abandoned novels altogether and concentrated on stories for Ellery Queen’s Mystery Magazine. 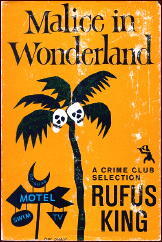 Malice in Wonderland, the second of King’s four collections, was so highly regarded by the Mssrs. Queen that they included it in their Supplement Number One (1951-59) to the Queen’s Quorum. Also excellent are the title story, in which a girl tries to decode a message from a long-dead playmate; and the long novelette “Let Her Kill Herself,” in which an unpleasant woman makes an extremely disturbing discovery. Some of King’s early short stories are collected in Diagnosis: Murder (1941). Two other collections of stories about Halcyon and the Florida Gold Coast, both of which rank with Malice in Wonderland, are The Steps to Murder (1960) and The Faces of Danger (1964). I was lucky to find this one in a second hand books shop in fine condition. An excellent collection from a period when the Florida thing hadn’t been beaten to death with a stick. King’s skill at plot shows in these well-constructed shorts. I have the book also, but I think I read most of the stories that are in it when they appeared in EQMM. Back then I read the magazine as soon as it came out, and from cover to cover. At the moment, though, I think I am 30 years behind, if not more. Me too. I don’t think I’ve read an issue of EQMM since the late nineties.